Here's a quick card I've made that fits with Hels Sunday Stamper challenge 185 with the theme of Santa Claus. 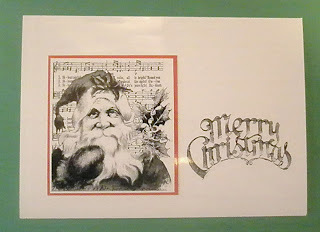 The stamp is from Tim Holtz's Santa's Wish set and has to be my favourite Santa stamp. It's such a timeless stamp - it can be left clean and simple or you can colour it, distress it, whatever you like. The stamp has enough detail to stand alone I feel. The greeting is from the same set. I'm also entering this in the "Less is More" challenge with the theme of MUSIC. Well I'm off to wrap a few more pressies. Hope you all have a wonderful Christmas and get lots of crafting goodies!! Welcome to "Less is More" Elaine... this is perfect for our challenge! Super card. Thanks so much for joining us and we hope you'll make our challenges a regular part of your crafting week! It would make commenting a whole lot easier if you could possibly remove the Word Verification from your blog! What a jolly old fellow, Elaine! I AM hoping to be able to buy more of TIM Holtz stamps next year! Especially his Christmas ones because i do adore that Santa! What a lovely image that is! It just says everything that you don't need a lot on the card. I really love this. I have to agree this is one of the prettiest Santa stamps, and you make an awesome card with it. I love this santa, he is cute. Lovely vintage image and great font!